Q. What are some of the challenges surrounding collection and recycling in Burdekin Shire Council? A. To put the Burdekin Shire waste management function into context, the Shire is about 5053 square kilometres in area and has a high rural population. The main urban areas of Ayr, Home Hill, Brandon and Giru have a three-bin service – general waste, recycling and green waste. A large part of the rural area, including minor towns of Clare, Millaroo, Dalbeg, Alva, Wunjunga and Jerona have a two-bin service – general waste and recycling. A commercial two-bin service is also available. The challenges surrounding collection mainly centre around determining suitable areas to economically service which involve consistent policy and practical servicing. The challenges of recycling are more variable and harder to control. Recycling at the kerbside requires willing participation by householders, that is not directly under the council’s control. Downstream recycling, such as mulch from processed green waste can be difficult to manage as it depends on the size and value of that market which can vary. It can also be very difficult to minimise contamination, resulting in a less desirable product. The costs of transport and lack of infrastructure in our region can be barriers to resource recovery. The Burdekin is a small local government area, so low product volume can also make recovery challenging. Q. What do you look for in a successful tender? A. It depends on the size and scope of the tender. For a recent large tender, the criteria we used to assess the tenders was comprehensive and included financial capacity, organisational capability, experience, delivery methodology, occupational health and safety systems, environmental management, compliance, and, of course price. Dependability, reliability and willingness to partner are key requirements for a long-term contract. For the new kerbside collection contract starting in July 2017 we were looking for higher service levels for our ratepayers. 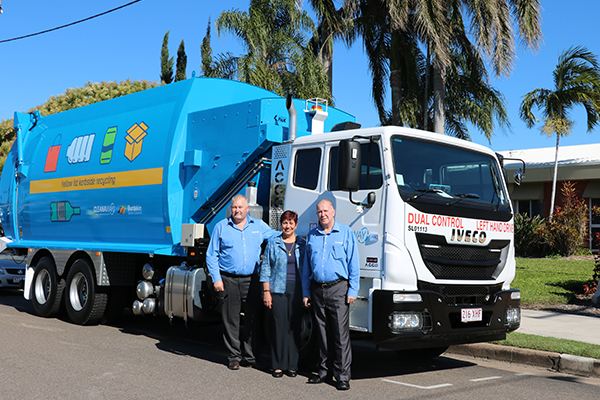 These included faster timeframes for delivering new bins, bin repairs and missed services. A. Generally for the urban areas, we have a three-bin system which includes a smaller, 140-litre refuse bin by default serviced weekly and alternate fortnightly recycling and green waste services. A 240-litre refuse bin is available at a higher charge. The 240-litre green waste bin assists in minimising green organics in the refuse stream and provides a convenient service for residents with average household quantities of green waste. The 240-litre recycling bin is great for separating the commonly known recyclables. Contamination rates in the green waste and recyclable bins are a problem as with most councils, making the end product less desirable. This is something that council is continuing to work on through education and contamination notices. Q. How do you work with the surrounding councils to drive diversion outcomes? A. We work extensively with surrounding councils – Townsville, Hinchinbrook and Charters Towers through the North Queensland Regional Waste Reduction and Recycling Plan (NQWRRP) working group. The group is about to release a request for quotation to conduct waste stream audits for kerbside collection across the region. We will be able to use the information gained from these audits to see what recyclable or reusable materials could be targeted for diversion strategies and further education. Q. How is Burdekin Shire Council progressing the outcomes of the NQWRRP? A. The regional group is set to review the NQWRRP in the next financial year. The group has been waiting for the state to finalise its strategy. We will be able to take into consideration the direction of the new Queensland resource recovery and waste strategy and the North Queensland Waste Infrastructure Plan which are set to be finalised in the near future. The councils in our region have been working together through our current NQWRRP for five years so we have a greater understanding of what works for our regional group and our own councils. Q. How do you see waste management evolving in North Queensland? A. Like many areas in Queensland, from a waste management progression perspective, we suffer from the disadvantages of low volumes and long distances. Many of the waste management improvement projects such as resource recovery, regionalisation and waste to energy plants require high and specific waste volumes and low transportation costs. Policy and major infrastructure decisions by councils will come down to cost and service level to the ratepayer. Unfortunately, unless there is some form of external funding to reduce transport and other costs or technological/legislative change to make recyclables more economically valuable, the pace of change in waste management operations and resource recovery will be slow.